For some reason this slogan stays in my head. I like the imagery. As a middle-aged woman with her fair share of troubles, a house on the corner of “happy and healthy” sounds like a nice place to be. Would you agree? Work and Home – The place where you precariously balance your time and energy. Menopause and Metabolism – The place where you can’t figure out how you got there (I can’t be old enough for this). And everything slows down except for the hot flashes. “Two steps forward and three steps back” – The place where young adult children seem to be teetering between flying or falling out of the nest. Or where I’m at most days in my own journey. Fear and Change – the place where the next step is one of faith. Yesterday and tomorrow – the place where regrets mingle with hope and the place where “now” is the most important thing. Failure and forgiveness – the place of healing and moving forward. The nice thing about corners is that you can always turn one and good things are often found around the next one. So today I’ll keep thinking about the “corners” in my life. 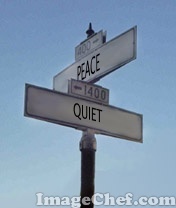 And maybe take a rest at the corner of “Peace and Quiet,” at least I can dream. What are the “corners” in your life? Love this! The “work and home” corner is a tough one for me — quite a balancing act — but it’s definitely part of who I am.